Are wrinkles and fine lines your biggest skin care challenge? Wanna look your best during the holidays? Try out Anavita Anti-Wrinkle Cream to stop your skin from aging faster than you would like. Say goodbye to wrinkled, sagging, dry skin in just a few short weeks! Anavita Moisturizing Anti-Wrinkle Cream is GUARANTEED TO LEAVE YOUR SKIN FIRMER, tighter, more toned, moisturized and more youthful looking. It's PROVEN TO STIMULATE COLLAGEN and reduce fine lines and deep wrinkles so you can avoid painful and more expensive procedures like facelifts or Botox injections. With a tested history of safe and gentle action by a LONG LIST OF SATISFIED USERS, this non-irritating cream is well-suited for all skin types. SIMPLIFY YOUR BEAUTY ROUTINE with this convenient anti-wrinkle cream, moisturizer, day cream, night cream, peptide cream, and makeup base. Paraben-free and cruelty-free, the cream features 3 clinically proven active ingredients. 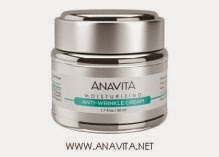 Anavita Moisturizing Anti-Wrinkle Cream retails for $29.95 on Amazon.com. Use coupon code USFG5OFF during checkout to receive $5 off. Shipping is free for prime members. Disclosure: I will receive a free product in exchange for this publication.